variety of boats and classes. straightaways and amazingly tight turns. Also at the race, there will be a "Cell Phones for Soldiers" drive. ESPN has a story on a former Fort Lewis Brat making heads turn in college ball. Fort Lewis's Meredith "Top Coach"
ALEXANDRIA, Va. (Army News Service) - Staff Sgt. 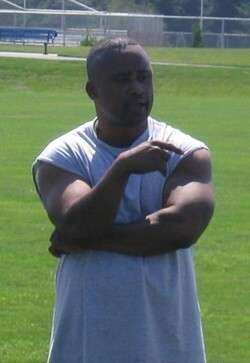 (retired) Lonnie Meredith, who led both flag and tackle football teams to successful seasons at Fort Lewis, Wash., has been selected as the Army's 2006 Coach of the Year by the Family and Morale, Welfare and Recreation Command. "Really, I was honored just to be mentioned," Meredith said. "I didn't know that I would even be considered, but to be the actual winner, I'm humbled." Meredith, 39, led Fort Lewis' post-level flag football team to a 5-2 record and served as a second-year offensive coordinator for the South Sound Shockers (10-1), a semi-pro tackle football team consisting of eight Soldiers and local former college and high school players. The Shockers finished second in the Pacific Northwest League. They lost the championship game to Seattle, 12-7, in Sumner, Wash.
His flag team won the 2006 Seattle Seahawks Military Appreciation Tournament on Qwest Field against squads from the Air Force, Coast Guard and Navy. They also prevailed in the annual Puget Sound showdown between Army and host Navy. Last April, Meredith attended the University of Washington's coaching clinic and spring football practices as a guest of Huskies coach Tyrone Willingham. "I reached out through the e-mail and coach Willingham's secretary got back to me with the invitation," Meredith said. "I was really amazed with his structure and the tempo of his operation." Discipline is the operative buzzword of Meredith's military and coaching philosophies. "I look at it from the standpoint in the military that you have to be disciplined in order to do what's required and to do it to the best of your ability, and that is your role in the military," Meredith explained. "It's the same way on the football field. If you're required to have a certain assignment, you have to do it because if you don't, you're going to compromise a play, which compromises the team, which compromises either a victory or no victory. "It's key because the person to your right and left are relying on you. If you fail then the whole team fails. ... I know it's a team effort. I've got some coaches and players that are responsible for my recognition. And I've got a mentor, Otis Sistrunk, who's really given me a lot of insight." Sistrunk, who was named to the Pro Bowl in 1974, played seven seasons as a defensive lineman for the NFL's Oakland Raiders and now manages Cowan & Memorial Stadium on Fort Lewis. "When he came back from Iraq, I told him I wanted him to coach at Fort Lewis," said Sistrunk, 62, who had watched Meredith work as an assistant coach before he was deployed. "He's a very good motivator and a go-getter. When [Fort Lewis officials] said they wanted to put him up for coach of the year, I told them that he was the perfect person. ... He runs a tight ship when he coaches. He's a down-to-earth coach and he loves the guys that he works with." Meredith served 20 years in the military and retired on Oct. 20, 2006. He continues working at Fort Lewis as a government contractor in human resources management and spends time with his daughters, Jasmine, 7, and Kira, 4. "One year, I had to hold his daughter from running onto the field while he was coaching," Sistrunk recalled of a game when Meredith's wife was deployed in Iraq. "He used to bring his girls to practice." Jasmine serves as the Shockers' water girl in order to spend more time with her dad. (I Corps release) – The Summit at Snoqualmie will be hosting a Military Appreciation Day on Saturday, January 20th in admiration of our courageous men and women in service. Military personnel and their families will benefit from savings on tickets, rentals, lessons, tubing and more. Attendees should proceed directly to any Summit ticket booth or rental location with a current Military Identification to receive the discounts. Military Appreciation Day is the perfect occasion to enjoy a fun filled day on the slopes at terrific savings. First timers can take advantage of our lesson package. The Summit Learning Center is full of dedicated instructors whose first priority is to make sure you are having fun while learning. Our staff will give you the tools and skills to conquer the varied terrain and snow conditions of the Pacific Northwest. Our First Turns Package includes a two-hour lesson, a ski or board rental, and a beginner lift ticket for ONLY $40! Army takes on the Navy in a rugby match at 11:30 a.m., followed by the Team Lewis Army/Navy Flag Football Tailgate Party at 3 p.m., December 1 at Cowan Stadium. Stop by for games, free food while it lasts and great prizes, and be sure to stay to cheer for the Army team as it plays the Navy in the flag football game at 4 p.m. The Lakes High School marching band is scheduled to perform at halftime. You must be at least 18 years old to attend the Team Lewis festivities. The games are open to everyone. For more information on Team Lewis Night, contact the Fort Lewis BOSS Team at (253) 967-5636. 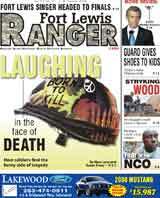 The Fort Lewis Ranger newspaper and America's Credit Union are also sponsoring a $1,000 Field Goal Contest. All in attendence have a chance to be picked to compete.